PASADENA >> Firefighters quickly extinguished a fire that ignited on the front porch of a home before it could cause major damage to the structure, officials said. The fire was reported about 2:30 p.m. at a house in the 2000 block of North Raymond Avenue, near Montana Street, Pasadena fire and police officials said. The flames first broke out on the porch of the home before working their way into the home’s siding, Pasadena Fire Department spokeswoman Lisa Derderian said. “But quickly extinguished before it spread into the attic,” she said. One woman was taken to a hospital after reporting that she felt faint, officials said. Four residents were evacuated from the home and a back house on the same property were not able to re-occupy their homes pending repairs to the electrical system caused by the fire, Derderian said. Derderian said the fire caused an estimated $26,000 worth of damage to the home and its contents. The cause of the fire remained under investigation. WHITTIER >> Authorities have released the name of a 19-year-old Bell Gardens woman who died early Saturday when the car she was riding as a passenger in crashed along Beverly Boulevard in Whittier, critically injuring the driver and another passenger. Maria Vasquez, 19, died at Los Angeles County-USC Medical Center shortly after the crash, which took place just after 1 a.m. on westbound Beverly Boulevard, just west of Citrus Avenue, Los Angeles County Department of Coroner Lt. John Kades said. She and a 21-year-old woman were thrown from a 1998 Chevrolet Malibu that struck a fire hydrant and a tree, Whittier police Lt. Bryan Ellis said. The 21-year-old passenger, as well as the driver, a 25-year-old man, were hospitalized in critical condition, officials said. ARCADIA >> Police jailed three allegedly impaired drivers during a checkpoint in Arcadia late Saturday, officials said. The checkpoint was held on Santa Anita Avenue near St. Joseph Street, Arcadia police Lt. Tom Cullen said. Three people were arrested on suspicion of intoxicated driving, while another seven were cited for driving without licenses, and one was cited for driving with a suspended license, the lieutenant said. Police stored three cars for one day, and one car was impounded for 30 days, he added. Funding for the checkpoint was provided by a grant from the California Office of Traffic Safety, through the National Highway Traffic Safety Administration. LA MIRADA >> Deputies issued 20 tickets but made no arrests during a sobriety and driver’s license checkpoint Saturday night in La Mirada, officials said. The checkpoint was held from 5 p.m. to midnight on westbound Imperial Highway, just east of Santa Gertrudes Avenue, Los Angeles County sheriff’s Lt. Eric Smitson said. No drivers were arrested during the checkpoint, however 19 tickets were issued for driving without a license, and one was issued for driving on a suspended license, sheriff’s officials said. Thirteen cars were released to other licensed drivers at the checkpoint. Deputies impounded six vehicles for one day, and a one vehicle was impounded for 30 days, he added. PASADENA >> A traffic stop led to the discovery of about 20 grams of cocaine in Pasadena Saturday afternoon, police said. Two officers pulled over a car for a traffic violation just after 4 p.m. at Los Robles Avenue and Mountain Street, Pasadena police Lt. John Luna said. Police arrested the driver, a Pasadena man in his 40s, on suspicion of possession of cocaine for sales, Luna said. Police withheld his name Sunday, citing an active investigation. PASADENA >> A 23-year-old Altadena man suffered major injuries in a solo-car crash early Sunday, police said. The crash took place about 12:13 a.m. on Marengo Avenue at Elizabeth Street, according to Pasadena police Lt. John Luna. The man had been driving a small sedan south on Marengo Avenue at a “high rate of speed” when the car left the road and struck a tree and a telephone pole, the lieutenant said. Luna said the driver ended up “partially ejected” from his car. Paramedics took the man to a hospital where he was in serious condition, Luna said. PASADENA >> A would-be robber attacked a man along Fair Oaks Avenue before a good Samaritan intervened and fought the attacker off Saturday, police said. Jaime Medina Ruiz, 28, of Pasadena was booked on suspicion of attempted robbery following the incident, which unfolded just after 7 p.m. along Fair Oaks Avenue, just south of Del Mar Boulevard, according to Pasadena police officials and Los Angeles County booking records. He was being held in lieu of $50,000 bail pending his initial court appearance. Ruiz confronted the victim, a 24-year-old Pasadena man, and demanded money, Pasadena police Lt. John Luna said. “When the victim told him he had nothing to give him, the suspect punched him in the face,” he said. But a 27-year-old Pasadena man who witnessed the crime rushed to help the victim, Luna said. “He fought with and attempted to restrain the suspect,” Luna said. The failed robber managed to flee. Police, aided by officers hovering overhead in a helicopter, soon found and arrested Ruiz in connection with the crime, Luna said. PASADENA >> Five home-invasion robbers shot a Temple City man inside a Pasadena apartment before fleeing with watches late Saturday, authorities said. The wounded man was shot in the arm and grazed in the torso during the crime, which took place shortly after 10 p.m. at an apartment in the 600 block of East Union Street, Pasadena police Lt. John Luna said. He was taken to a hospital where he was listed in stable condition. A second victim of the robbery, described as a 17-year-old Pasadena boy, suffered abrasions to his arm during the home invasion, Luna said. Police described the armed intruders as an Asian woman in her 20s, and four men of unknown race between 25 and 30 years old. The robbers fled with watches, he said, though the number or value of the watches was not clear. Officers discovered the crime scene after responding to a report of gunfire, Luna added. No further details were available Sunday. 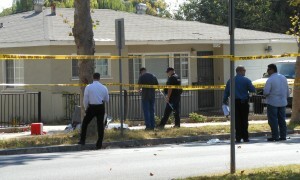 WHITTIER >> A man died after being shot in broad daylight Saturday in front of his Whittier home, authorities said. Police responded to reports of a shooting about 12:10 p.m. at the corner of Washington Avenue and La Cuarta Street, Whittier police Lt. Bryan Ellis said. 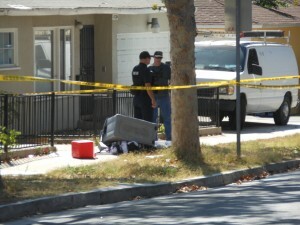 The victim, a 34-year-old Whittier man, was found lying unconscious outside, Ellis said. “Officers performed CPR. He was subsequently transported to (Los Angeles County-USC Medical Center) where he was pronounced dead,” Lt. Mike Przybyl said. The victim had been shot once in the torso, he said. His name was withheld pending notification of family members, officials said. At least one suspect — described only as a man — was believed to have fled the scene in a vehicle, Przybyl said, however a further description of the suspect or the getaway car was not available. The motive in the shooting also remained under investigation, Przybyl said. “We’re developing further, and at this point, we’re still trying to follow up on some of that,” he said. Neighbors expressed sorrow for the victim’s family. They added that the home is occupied by several children. Detectives examined items including an ice chest, an overturned plastic been full of clothing and a cell phone strewn along the street and sidewalk at the scene of the shooting. Detectives continued interviewing witnesses, taking measurements and collecting clues well into the afternoon. Detectives continued investigating the scene and interviewing witnesses of the midday shooting Saturday afternoon, he said. Anyone with information can contact Whittier police at 562-567-9200. PASADENA >> A Pasadena man is accused of attacking a parking lot monitor and a woman with a can and a large rock Friday afternoon, police said. 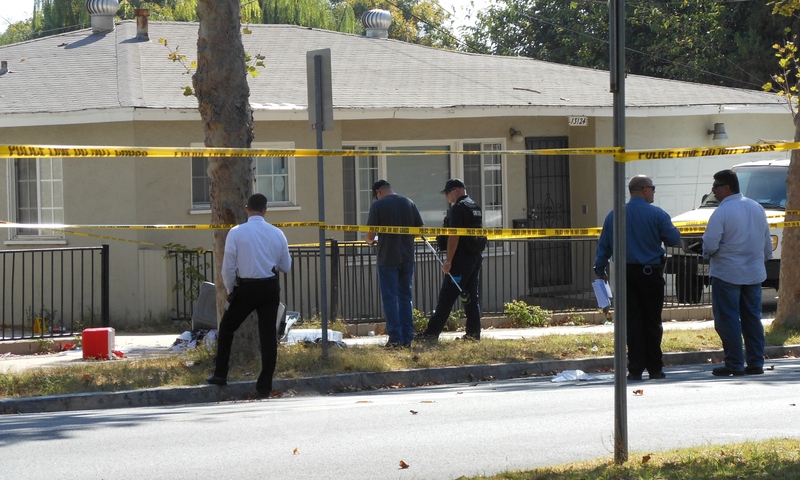 Shawn Jess Adelman, 43, was booked on suspicion of assault with a deadly weapon following the incident, which took place about 1:45 p.m. in the 1700 block of East Colorado Boulevard, Pasadena police Lt. John Luna said. He was loitering in a parking lot when the monitor, a 47-year-old Altadena man, asked him to move to a safer spot, Luna said. Adelman struck the attendant with a cane, and threw a large rock at both him and a 61-year-old Pasadena woman who was standing nearby, the lieutenant said. Police responded and arrested Adelman, Luna said. The parking lot monitor was taken to a hospital for treatment of injuries to his elbow and hand. The woman was not hurt. According to county booking records, Adelman was being held in lieu of $30,000 bail pending his initial court appearance.